The Wine and Cheese Place: Nov. 15th Pinot tasting with Siduri winemaker Ryan Zepaltas! Nov. 15th Pinot tasting with Siduri winemaker Ryan Zepaltas! Wednesday, November 15th wine tasting with Siduri winemaker Ryan Zepaltas! Our grand Siduri pinot noir tasting with Ryan Zepaltas is next Wednesday! -Free open house tasting for our 35th anniversary! Taste a truly amazing lineup of appellation and single vineyard wines including Siduri's exclusive 60 btl production Willamette Valley Auction wine, the 2015 "The Stranger" Pinot Noir. See more info on that wine below. We will be tasting wines representing 4 very different areas of production from which Siduri makes Pinot Noir, and then as a bonus 4 fantastic single vineyard wines, one from each of those corresponding appellations! We hope this format will give tasters a unique opportunity to compare and contrast Siduri's wines based on their different terroirs. Let us know on Facebook if you plan on attending, thanks! Back in April, Kole, our wine buyer at the Rock Hill location attended the Willamette Valley Pinot Noir Barrel Auction. This very limited, industry only event, exclusively features small lots of inimitable Pinot Noir. Kole was able to win the Siduri auction lot, a super limited 5 case Pinot Noir lot titled, The Stranger! Join us Wednesday Nov. 15th to taste this one of a kind Pinot Noir and other selections from the Siduri portfolio! 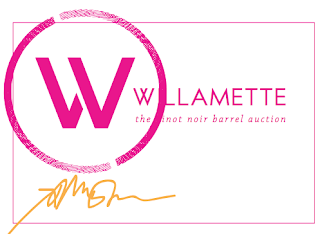 Willamette: The Pinot Noir Auction, in its third year, is the leading event to showcase Pinot noir of the Willamette Valley while helping support the promotion of this exceptional Oregon wine region. At Willamette: The Pinot Noir Auction, influencers of the wine trade get to experience what makes Oregon remarkable, exemplified in unique expressions of the best Pinot noir from local wineries. 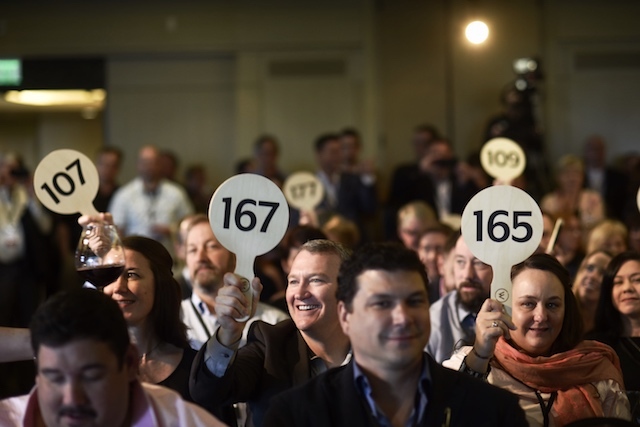 For two days, 80+ of the region’s wineries and winemakers will host a series of special tastings and gatherings, culminating in a live auction. Members of the trade and their guests will try Pinot noir of outstanding quality, produced in extremely limited quantities, and representing a wide range of terroirs and styles. 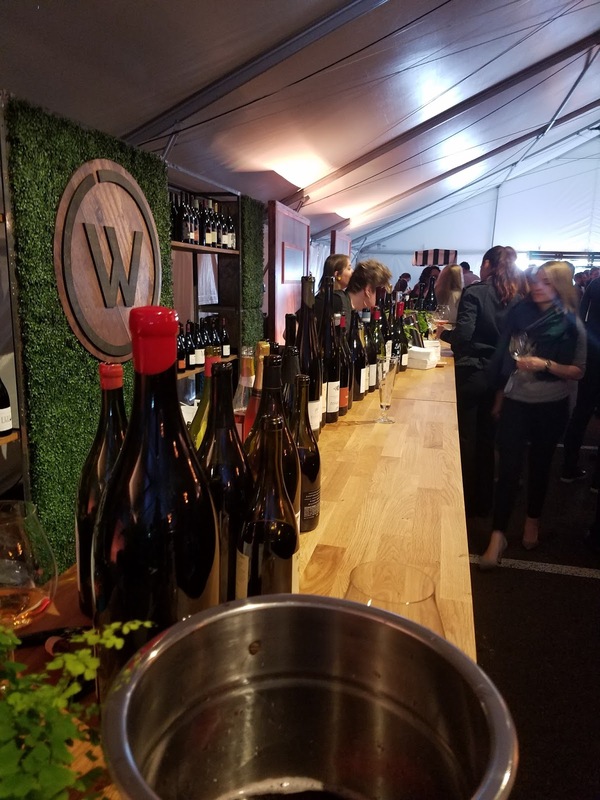 Willamette guests have the opportunity to acquire an exceptional lot of one-of-a-kind Pinot noir and an unforgettable impression of the Oregon wine community. In 1955 Albert Camus wrote about his seminal work, "The Stranger" saying that his hero "is condemned because he does not play the game”. 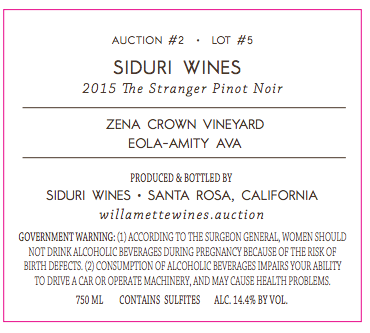 With this wine, Siduri's first from the Zena Crown Vineyard (Zena, meaning "Stranger" in Greek), we have chosen to play no games. Instead we've worked to produce our finest Oregon offering from this remarkable property. With this limited production offering only you can partake in our wonderfully absurd quest to produce some of the finest Pinot noir in the world. Winery Information: Founded in 1994, Siduri Wines is named after the Babylonian Goddess of Wine. Siduri Wines produces Pinot noirs from Oregon’s Willamette Valley down to the Sta. Rita Hills in Santa Barbara County. Our portfolio is made up of Single-Vineyard and Appellation Pinots from some of the finest vineyards on the West Coast. Each wine is crafted by winemaker Adam Lee to be a pleasure to drink while also reflecting its unique origins.